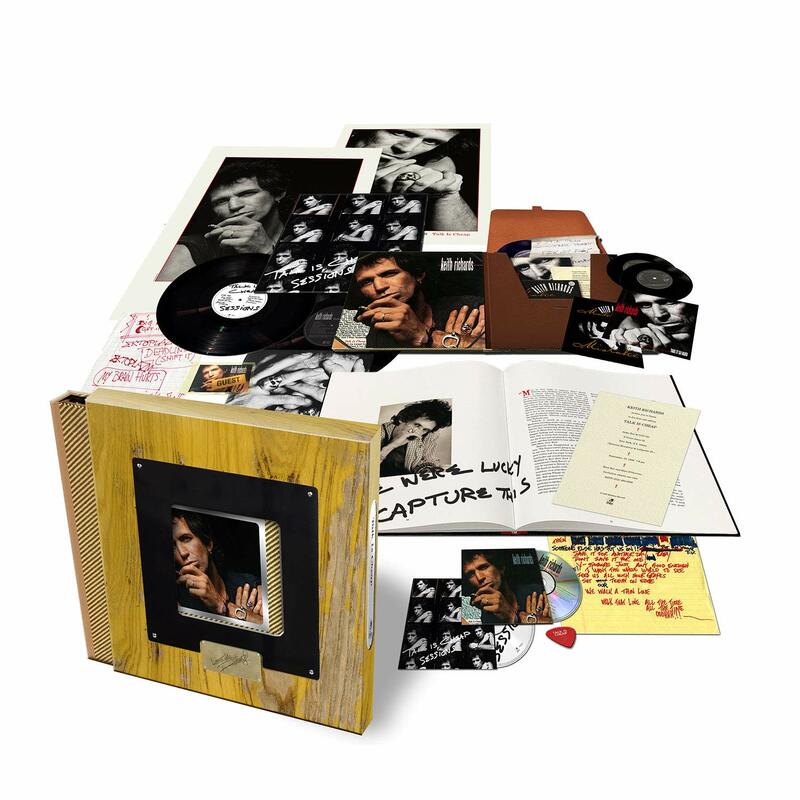 About: In 1988, on a break from his band the Rolling Stones, Keith Richards released his first ever solo album, Talk Is Cheap. This universally respected debut is an eleven track masterclass in everything that’s good about rock ‘n roll and features guest appearances from an all-star cast including Sarah Dash, Bootsy Collins, Maceo Parker, the Memphis Horns, Patti Sciafia and Mick Taylor. Remastered from the original tapes by Richards' collaborator, Steve Jordan, the album's joyous swagger is re-energised and permeates through each and every song. 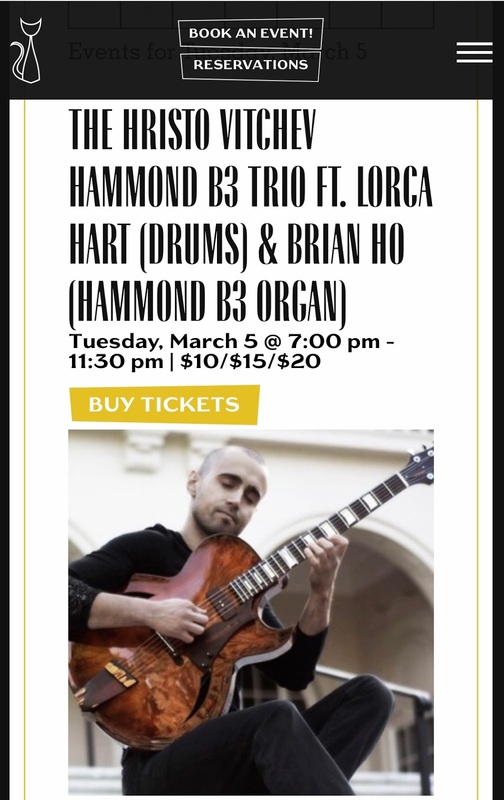 The Hristo Vitchev Hammond B3 Trio, featuring Lorca Hart & Brian Ho at the Black Cat, San Francisco, CA, March 5, 2019. 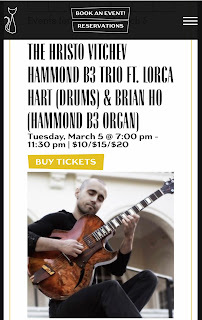 Lineup: Hristo Vitchev, guitar; Lorca Hart, drums; Brian Ho, Hammond B3. Lineup: Mike Garson (keyboards); Earl Slick (guitar); Charlie Sexton (guitar and vocals); Carmine Rojas (bass); Bernard Fowler (vocals); Corey Glover (vocals); Gaby Moreno (vocals); Lee John (drums); Imani Elijah (percussion); Naia Kete (backing vocals). 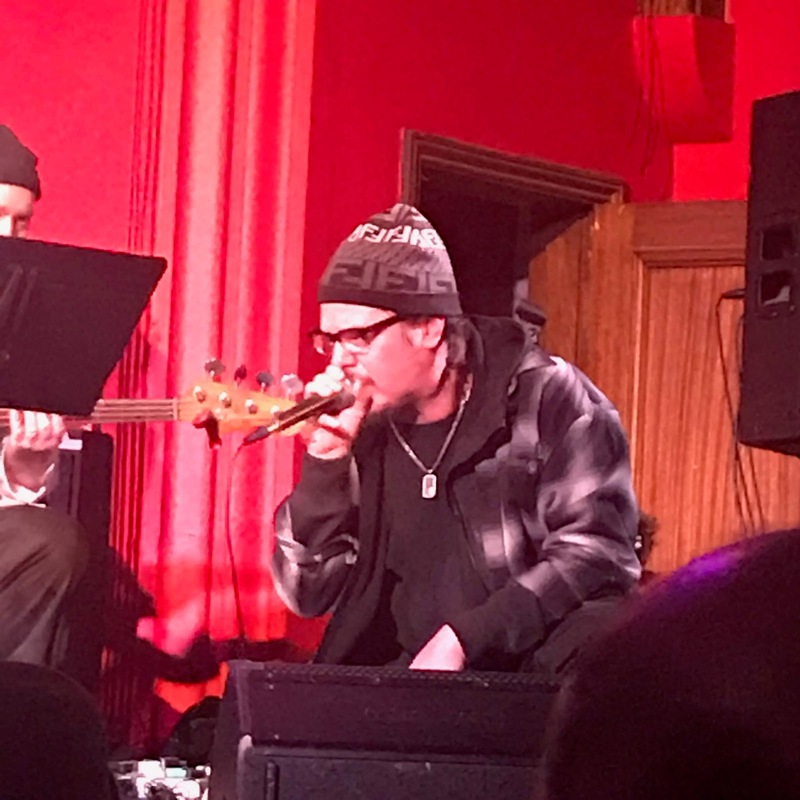 Setlist: Bring Me the Disco King; Rebel Rebel; Moonage Daydream; Fame; Young Americans; Space Oddity; Lazarus; Five Years; Slip Away; Stay; Win; Ashes to Ashes; Sweet Thing > Candidate Sweet Thing (reprise); Aladdin Sane; Under Pressure; Suffragette City; All the Young Dudes. Encore: Wild is the Wind; Diamond Dogs; "Heroes". 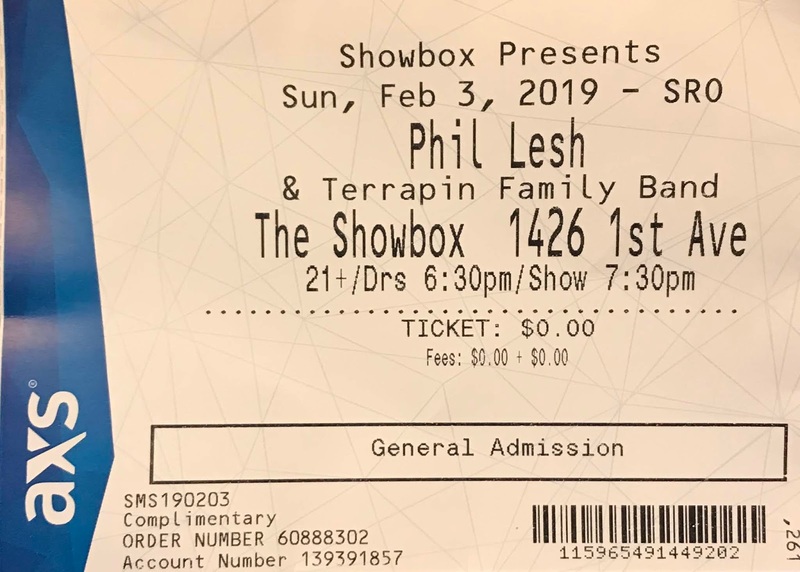 by Taylor Mims in Billboard Magazine, February 11, 2019. In just over a year, ticketing exchange platform Lyte has gone from six festival partners to 30. Lyte has made a name for itself allowing fans to safely buy, sell and exchange event tickets after sell-outs, and has carved out a significant niche for itself in the world of high-profile festivals. Lyte has partnered with country music festival Stagecoach since 2018, Newport Folk Festival for three years and Napa Valley’s Bottlerock for four years. For 2019, Lyte has partnered with Coachella and introduced new features to accommodate one of the world’s biggest festival names. Read the full piece here. 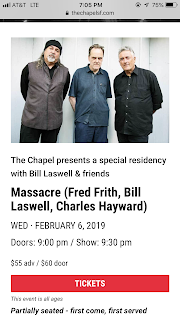 Lineup: Fred Frith (guitar); Bill Laswell (bass); Charles Hayward (drums). 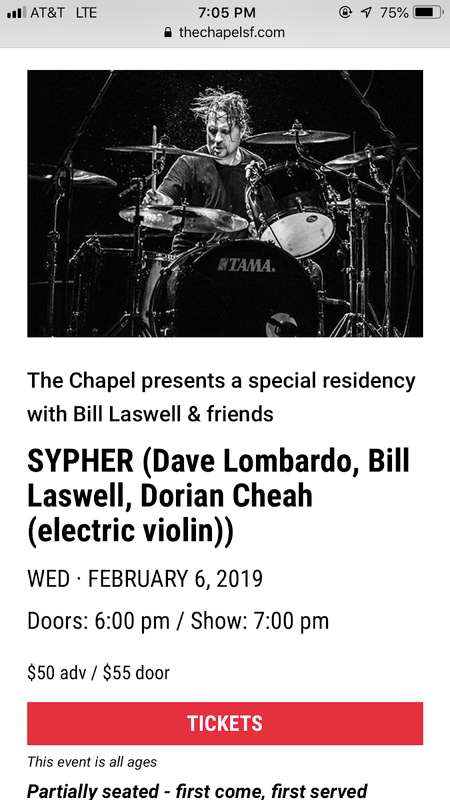 Lineup: Dave Lombardo (drums); Bill Laswell (bass); Dorian Cheah (electric violin); special guest Mike Patton (vocalizations). 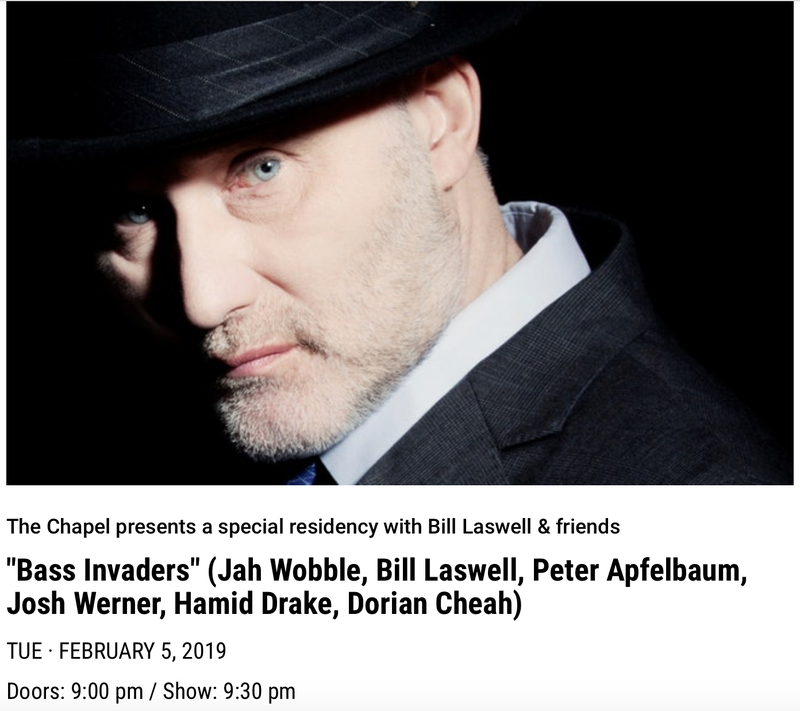 Bass Invaders, The Chapel, San Francisco, CA, February 5, 2019. Lineup: Jah Wobble (bass and percussion); Bill Laswell (bass); Peter Apfelbaum (bass and keyboards); Josh Werner (keyboards, horns, percussion); Hamid Drake (drums); Dorian Cheah (electric violin). 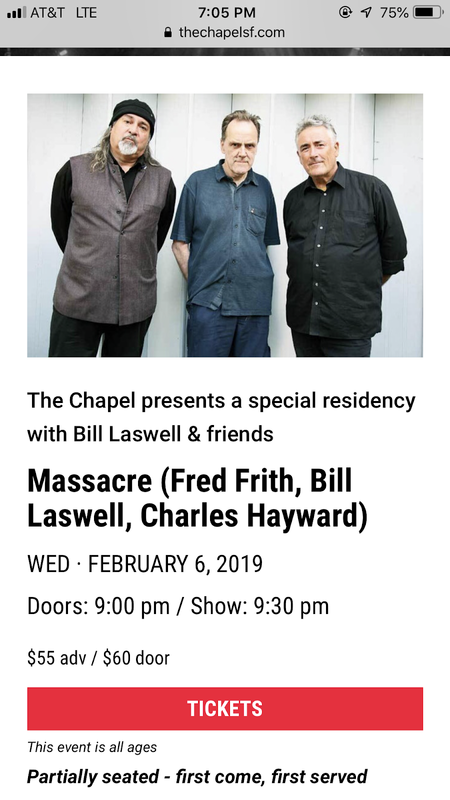 There was also a guest vocalist who was not on the original bill. 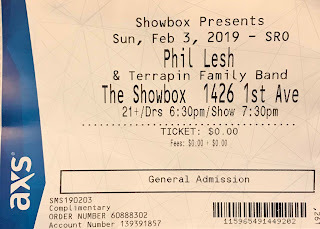 Phil Lesh & Terrapin Family Band, The Showbox, Seattle, WA, February 3, 2019. Django's Birthday, featuring Victor Horky's Silk Road Swing and Ranger and the 'Re-Arrangers', at the Royal Room, Seattle, WA, January 19, 2019.